If I am not mistaken this is the first product I have ever reviewed that received a 6 in more than one category. Ya'll I'm shook by this one. I am a DIE HARD Beauty Blender purist. I have tried many dupes and new kinds of blenders that have hit the market and nothing has stuck until this one. I have tried so many sponges because the brand name Beauty Blenders are $20 each, and that's a lot. Especially because my dog LOVES to chew foam and she has literally eaten THREE of my beauty blenders. THREE! That's $60 in makeup sponges. Anyways, dog aside, even when I have found something that is a fairly good match, I always find myself reaching for my beauty blender over it. Eventually the dupe gets tossed into my box of rarely used items. The true test of a product is if it replaces my go-tos. And this sponge has. I find myself reaching for it over my beauty blender frequently. Let me break it down below. So first things first it comes in a small eco friendly recyclable plastic bag. I'm a fan. The actual sponge is a pretty shade of blue that is gender neutral and lovely. The size is perfect, and you can wet it and it will expand to be larger, just like others do. The shape is great. 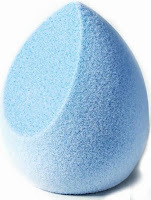 It has the egg shape of a beauty blender with an added flat edge that is nice for larger areas or surfaces. I personally don't like the flat edges so I don't use them all to often and I feel they diminish the effectiveness of the pointed end. Onto the good stuff. I sue WAY less foundation with this sponge than the beauty blender. It has a layer of material that is moisture-wicking so it shouldn't absorb product like most sponges do. I found that claim to be true. I use about half as much product now than I did before, there is staining, but not absorption. It also claims to give a more full coverage effect and that is 100% true. In fact it recommends you apply your foundation onto your skin and not the blender, because it can be to full coverage. I did apply using the sponge itself, but I dotted the product around my face before blending. When it's dry you will get a beat, instaglam, full coverage look in no time flat! With it wet you will also get full coverage, just a more natural version of it. You can not get a super light coverage with this unless you are using a tinted moisturizer or if you apply almost no product, It packs that pigment in a way that the beauty blender doesn't. I actually like sporting booth looks (depending on the day and outfit) so Is till use both sponges regularly, but if you're a glam, matte, full coverage drama kinda gal, then this is it. It's also WAY more durable than the beauty blender. It doesn't tear as easily and really works. Plus, it's $6, and you can get a 4 pack for $20 (making them $5 each). That's nuts. Pick yours up here.